Newly-crowned British MX2 Champion Stephen Sword picked up the overall win at the final round of the series at Landrake in Cornwall. He was joined on the podium by overall runner-up Billy MacKenzie and third-placed Jason Dougan. Race one saw Billy MacKenzie on the CAS Honda show everyone who was boss by beating Shaun Simpson on the Red Bull KTM over the line by 6.057secs. He didn’t get the best of starts but came through from third place to take the lead on lap eight. Simpson, who has just stepped up to MX1 this weekend, got the holeshot and led for the first eight laps. His MX1 debut was certainly spectacular and his team-mate Sword, raced to an equally impressive third place. In the second race of the day it was Bryan MacKenzie who shot into the lead. His cousin Billy got tangled up with Simpson and they both took a tumble. 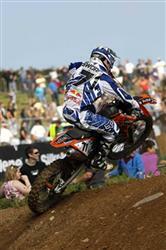 Both managed to re-start but Simpson fell again later in the race and could only manage a tenth place finish. A slip up from Bryan MacKenzie allowed Sword hit the front just three laps in and he was never challenged. Jason Dougan on the Phoenix CCM slipped into second place but was pushed back down the order by James Noble on the STR Honda. Dougan was relegated another position when the hard riding Billy MacKenzie took third.